What To Do When Riding Disasters Strike! None of us expect to have a disaster strike, but most of us have had a medical emergency arise while riding, whether to ourselves or others. Do you know what to do to when disasters strike on the trail? In this article, we’ll cover some of the medical basics and emergency procedures to follow as well as a quick look at what products are available to help. When accidents happen that result in injury, the first thing to do is evaluate the victims condition (without moving them) as quickly as possible. Can you see the most obvious injuries? Has the head or helmet taken an impact? CALL FOR HELP! Use your cell phone and your GPS coordinates to call 911 immediately if warranted and don't be afraid to shout for help as soon as you begin first aid measures - keep trying until you know you've been heard and action has been taken. WHAT HAPPENED? Ask the injured person what happened…can they tell you how serious the accident was and where the most pain is? Make sure that performing first aid isn't going to be dangerous for you as well as the victim. Are there fumes or flames? Is the bike and/or victim in a precarious place that may cause further injury? Be positive that you aren't in any danger before you start first aid, because you won't be much help if you get injured as well. HOSPITAL REQUIRED? Use your common sense. If you see the injury is minor, make your way off the trail and to the hospital or walk-in clinic if required. But if the victim is unconscious, bleeding heavily or has sustained a compound fracture or other serious injury that would prevent them from evacuating with your help, you need to make that 911 call immediately. Are the airways clear? Is the rider breathing? What about circulation? Is there a pulse? What about moving them? Don't move a person if there isn't a life-or-death reason to do so, you might cause more harm. If the victim has back, head, or neck injuries, moving them can make the injuries worse or even cause permanent damage or death. ATTEMPT CPR: If you are trained in CPR and a person cannot breathe, begin CPR right away. Do not attempt to resuscitate if you are not trained in CPR! You can break the ribs or puncture the lungs. If you don't know CPR, use mouth-to-mouth resuscitation techniques or for choking, use the Heimlich maneuver and remember to loosen the victim’s clothes to ease breathing. STOP THE BLEEDING: If the injured person is bleeding, apply direct, even pressure with a cloth and your hands to slow and stop the flow. (Protect yourself against HIV and other infections while in direct contact with blood). Lift up a bleeding limb if it doesn't cause substantial additional pain. Make and apply a tourniquet only as a last resort. SHOCK: If the victim is nauseous, clammy and pale, it is possible they are in shock and could slip into unconsciousness. Watch for vomiting, because that can also be a sign of shock. You want to keep breathing unobstructed, so if no back or neck injury is suspected, gently roll the victim's body to the side to keep their airway open and prevent vomit from collecting in the back of the throat causing choking. LOOK FOR INFORMATION: Look for any medical information on the victim like a Medic Alert bracelet, necklace or wallet card. Sometimes this information will be on a sticker on the victim’s helmet or driver’s license as well. This will inform you and the first responders about the victim’s medical history and if the victim is diabetic, epileptic, or allergic to any medications or treatments. When talking to EMS or first responders, provide as much information as possible about the victim and the injury. Are they conscious, bleeding, in shock? The more information you can give, the better prepared the responders will be when they arrive. JUST WAIT: The waiting is the hardest part. While you're waiting, try to keep the victim calm. You can provide comfort by talking and telling them help is on the way, stay calm as the victim has put their life in your hands. MOST COMMON OFF-ROAD INJURIES: WHAT ARE THEY? A fracture is a break in a bone. If the broken bone punctures the skin, it is called an open or compound fracture. Collarbone fractures and breaks are common injuries when riding off road machines and are among the more serious of injuries. Because it sits directly under the skin and has very little padding, it is the most common larger bone fracture seen in adolescents and athletes of all ages. Compound fractures are much more serious than common under the skin fractures. Never attempt to push on or re-align a bone that is protruding. Instead, cover the area with a clean bandage and stop the bleeding - apply steady, direct pressure with a cloth for 15 minutes and elevate the wound. If blood soaks through, apply another cloth over the first and seek immediate medical attention. Note: Never move the injured party if another way of being extricated is available, it’s better to stabilize the victim and try to keep them from going into shock if help is fairly close by. Some trail systems have organized rescue teams run by experienced trail bosses that have faced this situation before and are much better equipped to deal with it that you are. Anytime the skin is broken and you start “leaking”…that can signal the beginning of a bad situation. For minor cuts and abrasions, apply pressure to the wound with a clean bandage and clean the skin around the wound with soap and water. Hold under running water to remove dirt and debris as necessary and pat the wound dry with sterile gauze and apply antiseptic ointment. In the case of bigger cuts, close the wound with sterile adhesive wound closure strips. If strips are not available, cover the wound with clean gauze and adhesive tape and don’t use cotton. Adhesive non-adherent bandages can be used for abrasions that continue to ooze blood and make sure to change the dressings at least once a day to avoid infection. Strains are the result of overstretching or tearing the tendons and/or muscles that help support and move your joints. Many strains are minor but some can be severe such as a tendon that could completely sever and require surgical repair. Sprains are likewise caused by overstretching or tearing, but they occur in ligaments. Bruises happen when those body parts described above sustain a severe impact, large enough to injure capillaries, so they break open and cause blood to collect under the skin and in the injured tissue. Bruising can even occur in vital organs, if the injured tissue is a vital organ. I initially wanted to include some first aid kits that you could carry on your bike…but almost 100% of the riders I spoke to said they wouldn’t carry one! Most agreed that a good kit “back at the truck” would do. So with that in mind we spoke to some folks who are active in the outdoor scene and looked at what they use. First Aid Kits are a no-brainer and Adventure Medical Kits makes a low-priced, high value kit called the Ultralight and Watertight .9 that contains items like bandages, wraps and trauma pads, all in a watertight kit and this is good to keep “at the truck”- or when on longer trail rides with others as it can be easily carried with it’s small size (10”x10”x3”) and light weight (12oz). I’ve used the AMK products before and they are fairly comprehensive, and to supplement them I also throw my SmartCrutches in the truck just in case. If you’re looking to go all-out with a stationary first aid kit, take a look at the MedSource Highway Patrol Medical Cab Bag – it’s got everything you’d ever need for a group of riders. Personal Locator Beacons have been gaining ground in other sports such as snowmobiling and bicycling and this technology is available to the rider who may want to go solo. These devices are worn on your body and in the event of an emergency; they can be easily activated to send a “SOS” with your GPS coordinates to first responders. One product that is starting to take over this category is the ACR ResQLink PLB which is a PLB that employs some of the best new technologies and does not require a paid subscription. It has three levels of integrated signal technology - GPS positioning, a 406 MHz signal and 121.5 MHz homing capability. The Future is Coming: In talking to moto-industry expert Brian Horton, he told us about a new product that’s being developed by SaPHIBeat that would take away the manual activation of the PLB, taking it to more useful level. It’s a wearable safety device, named Phi-Pal, that will attach to your helmet and utilize either your cell phone or GPS to track your location In addition to this, Phi-Pal can also determine if you’ve suffered a serious accident and automatically send this info to your friends, teammates and emergency services, alerting them to both the time and location of your accident in order to send help. AFTER THE CRASH – NOW WHAT? OK, so you’ve used the advice and tools above to get out alive and after your time with that friendly doctor and cute nurses, it’s time to go home…but now what? We spoke at length with Dr. Christopher Mascetta DC, CCSP at the Ridgefield Chiropractic & Wellness Center, Dr. Mascetta is a Certified Chiropractic Sports Physician with a specialized practice catering to the sport of motocross called Motocare Chiropractic. We asked about what to do when recovery is your goal. XLADV: What services do you offer recovering riders? Dr. Chris Mascetta: I provide chiropractic care and associated modalities such as extremity adjusting, soft tissue techniques, stretching, Electric Muscle Stimulation, Ultrasound, Cold Laser Therapy, athletic and kinesio taping and nutritional therapies on race day at local and national professional motocross events. It is my goal to offer my services to every professional motocross rider on the AMA National Outdoor Motocross, Supercross and Arenacross Championship series at no charge. XLADV: What are the most common off road injuries you see? DCM: I see a lot of neck and back injuries including everything from herniated disks to sprains and strains. Motocross riders are also notorious for putting a lot of strain on their upper extremities, so a lot of my day is spent working on sprained wrists, elbows and shoulders. I also assist the riders with arm pump issues. XLADV: What can injured rider do when they are at home recovering for these common off road injuries? DCM: My first recommendation is to take some time to let the injury rest and heal. It is not a wise choice to push things too soon. Depending on the seriousness of the injury, I recommend to start right away with gentle range of motion exercises, stretching and deep tissue work to help start the healing process, while reducing the formation of adhesions and scar tissue in the soft tissues. Seeing a chiropractor to ensure proper joint alignment and function is always a good idea early on in an injury, this can help speed up recovery in a big way. I always caution a rider to be careful stretching a newly strained muscle. The muscle is already over stretched and torn, so stretching it more just might cause more damage. In these cases I recommend a lot of deep tissue work to soften up the injury and let it heal. A rider can use things such as a foam roller, tennis balls, or a thera-cane to assist in this process. These therapies are easy, effective and can be done at home. I also recommend initially rehabbing an injury using a thera-band. A rider can start this process almost immediately after an injury. This will help stabilize and strengthen damaged tissue and enhance the range of motion, which will aid in recovery. I would recommend a rider follow the R.I.C.E protocol of Rest, Ice, Compression and Elevation immediately following an injury. I recommend cold therapy for the first day or so of a new injury followed with moist heat. My recommendation for cold therapy is to fill a plastic zip lock bag with ice and tap water, and put directly on the injury. The tap water keeps it from getting too cold to do any damage to the skin. Leave on for 10-12 minutes at a time with about 30 minutes in between therapy sessions. After a couple of days or so, once the injury seems to be calming down and healing, I recommend to switch to moist heat. The number one mistake I see patients make with heat is that they let it get too hot, and then they either burn themselves or further irritate the damaged tissues. I recommend only getting the tissues warm, and not to leave heat on the injury for more then 15 minutes. This amount of time should be sufficient to warm the tissue and provide some healing and relief. A rider can also purchase an over the counter TENS machine, which are now readily available at pharmacies. A TENS unit will help reduce pain, spasm and may aid in healing. I also recommend that riders purchase Kinesis style tape, also available in pharmacies. This will help give the tissues some additional support and aid in recovery. They should also follow up with a physician or chiropractor if they have any indication that the injury is worse then they think they might be able to treat on their own. If there are any significant changes in skin color, gross misalignment, unusual bumps, numbness or tingling into extremities, change in skin temperature, shortness of breath, confusion, memory loss, double vision, tenderness or swelling over the abdomen, dark urine or dizziness, they should immediately seek medical attention. XLADV: After a riding injury such as a sprain or strain, what therapy is offered? 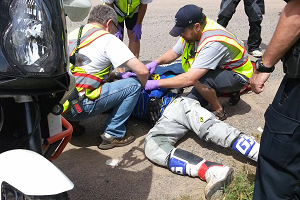 DCM: When evaluating an injured rider I am looking to answer two questions. First, I want to find out if it is the type of injury that I can help with chiropractic care. If not, I will make the appropriate recommendation and referral. Secondly, I want to, as accurately as possible, diagnose the condition and inform the rider of what we might be dealing with and the appropriate course of action. Then I will provide chiropractic care, soft tissue techniques, stretching, and stabilization exercise and physiotherapy modalities. I will also recommend the appropriate professional grade nutritional supplements to help aid in tissue repair. First we will first start with pain relief, followed by spinal or joint stabilization and correction, and finally chiropractic wellness or maintenance care. 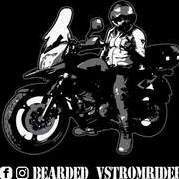 XLADV: What off road specific treatment products do you use? Slings, tape, casts, compression clothing, etc.? DCM: I travel with a portable chiropractic table and a medical bag, portable TENS unit, ultrasound and cold laser, a variety of creams and lotions including massage lotion, magnesium gel, natural anti-inflammatory pain cream, athletic and Kinesis tape, instant cold packs, thera-bands, adjusting tool, and a first aid kit. In conclusion, keeping a first aid kit within range or even on your bike are good ideas and there are affordable kits for this purpose…there’s no excuse not to have one if you participate in our sport. Other technologies like GPS locaters are also available for solo riders and new hands-off technologies are coming fast. If you do get hurt see a medical professional for both initial treatment and follow up. Disclaimer: XLADV.com is not designed to and does not provide medical advice, professional diagnosis, opinion, treatment or services to you or to any other individual. Through this site and linkages to other sites, XLADV.com provides general information for educational purposes only. The information provided in this site, or through linkages to other sites, is not a substitute for medical or professional care, and you should not use the information in place of a visit, call consultation or the advice of your physician or other healthcare provider. XLADV.com is not liable or responsible for any advice, course of treatment, diagnosis or any other information, services or product you obtain through this site. Never disregard medical or professional advice, or delay seeking it, because of something you read on this site or a linked website. Never rely on information on this website in place of seeking professional medical advice. You should also ask your physician or other healthcare provider to assist you in interpreting any information in this site or in the linked websites, or in applying the information to your individual case. Medical information changes constantly. Therefore the information on XLADV.com and on the linked websites should not be considered current, complete or exhaustive, nor should you rely on such information to recommend a course of treatment for you or any other individual. Reliance on any information provided on this site or any linked websites is solely at your own risk. XLADV.com does not specifically recommend or endorse any specific tests, products, procedures, opinions or other information that may be provided on the linked websites.